Constructed in 1913, this charming depot was, and still is, the focal point of Roaring Springs. It is an example of many good historic buildings in Texas that are not forgotten; but suffer from a lack of funds for restoration. Even after the railroad abandoned the line, community groups used it as a meeting place and a depository for town and school memorabilia. However, the now vacant building needs repairs to keep out the weather that is causing damage to the interior. 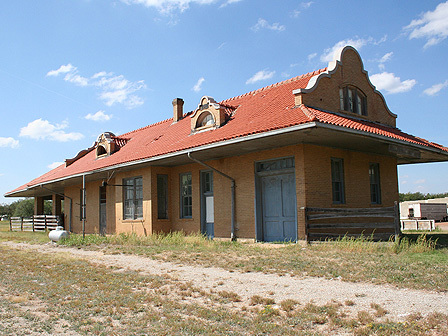 The Friends of Roaring Springs Depot are raising funds and want to see their depot used again; this time to house the City Hall. UPDATE: The Depot has been stabilized and acts as a museum and visitors center for the town of Roaring Springs.